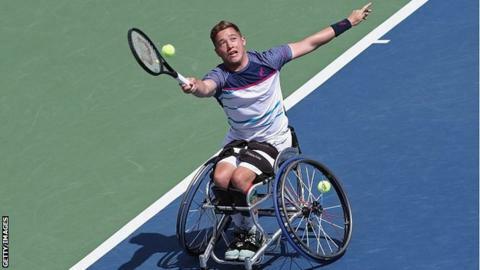 Britain's Alfie Hewett and Gordon Reid won the US Open wheelchair doubles title with victory over top seeds Stephane Houdet and Nicolas Peifer. The second seeds, who beat the same French duo to retain their Wimbledon title in July, triumphed 7-5 6-4. "I felt like we played a really composed match and we deserved to win today," Reid said. They teamed up hours after unseeded Hewett beat Reid 7-5 5-7 7-6 (10-8) in a wheelchair singles semi-final. Both Hewett, 19, and Scottish second seed Reid, 25, had match points during the final set of their singles semi-final, but it was the Englishman who prevailed after three hours and two minutes. "I'm a bit speechless right now. It was an amazing match," said Hewett. "It was absolutely exhausting." Hewett faces 2013 champion Houdet on Sunday and will be looking to add the US Open title to the French Open crown he won earlier in the year. Elsewhere, Britain's Andy Lapthorne and American David Wagner teamed up to win the wheelchair quad doubles title. The three-time Australian Open champions beat Australian Dylan Alcott and Bryan Barten of the United States 7-5 6-2 in the final. The pair will also meet in Sunday's quad singles final after negotiating their way through a tricky round-robin format. Lapthorne beat Barten 7-5 6-2 in their final quad singles match which meant the format ended with a three-way tie - Wagner, Alcott, and Lapthorne each winning two and losing one match. However, it was the Briton and Wagner who advanced to Sunday's final as they had lost the fewest sets overall.